Holiness In Leviticus 19:1, G-d instructs the children of Israel to be holy, for G-d is holy. He then went on to explain how people can be holy in what has become known as the Holiness Code, a series of actions for them to undertake or alternately not to commit. What does holiness mean to us today? I have mentioned many times in our Saturday morning discussions that each one of us is holy because G-d, our creator is holy. There is a spark of G-d in each and every soul. Can you feel that holiness and a connection to G-d? I am often told that people have a hard time recognizing that personal holiness. It is sometimes expressed in the doubt that G-d even exists. assist you in your endeavors. You don’t have to do it all alone. As we approach the High Holidays, why not start looking today to find that holiness that is your connection to G-d? It really is there. We all have it, whether we can feel it or not. Take these last few weeks before the holidays arrive to search inside of you and try to find the holiness with which G-d endowed all of us. Prepare for the holidays by resolving to give more of yourself in any way that you can. Your connection to G-d and holiness comes by doing for others, by treating others as you would like to be treated. It isn’t that difficult. If you do, you will soon discover that you, too, really are holy. Ketivah v’chatima tovah! May you have a good inscription sealed in the Book of Life! Regular Services At Etz Chaim Everyone is welcome to join us for regular services held at Etz Chaim all year round: — Shabbat Morning — Saturdays at 9.30. Followed by Portland’s best Oneg. — Evening Minyan every Monday at 5. — Our Family Kabbalat Shabbat Service on the 2nd Friday of Each Month at 7 p.m. Will Resume the 13th of October. Our guest speaker will be Paul Ledman, author of Walking Through History: Portland Maine On Foot. Meanwhile Please Join Us Any Monday or Saturday For Services. 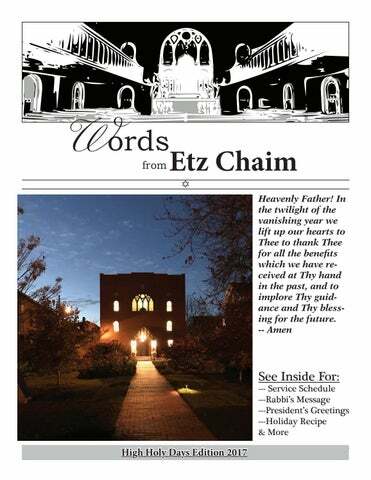 Remember that a donation to Etz Chaim in honour of the new year, a mitzvah, in memory of a loved one or for any other purpose both helps your shul, and is a great way to add recognition to an event. To donate, please contact Rabbi Gary Berenson at the address, e-mail or phone below. And thanks to those who have given their generous support! Etz Chaim, formerly an Orthodox congregation, is now an egalitarian, unaffiliated synagogue enjoying a resurgence in membership. All are welcome to attend weekly services on Monday Evenings and Saturday mornings, as well as once-a-month on Friday evenings, and for special holidays throughout the year. Lifecycle ceremonies such as bar/bas mitzvahs, weddings, funerals, baby naming, and vow renewals all take place here. Contact us if you would like us to host your special event. Etz Chaim is located in the Downtown Portland Historic District, on the peninsula at the foot of Munjoy Hill. The neighborhood housed so many Jewish families at the turn of the twentieth century, that it was commonly referred to as â&#x20AC;&#x153;Jerusalem of the North.â&#x20AC;? Established in 1921, Etz Chaim is celebrating its 96th year of continuous service to Jews in Greater Portland and beyond. wise seen increasing visits, with 2 million new patrons this year, and 60% of its traffic coming by search. That group noted that millennial parents – those between 25 and 35 with children -- make up the majority of its new visitors and contributed to a diverse audience that no longer sees kosher as a niche category. “What is surprising is that many manufacturers go through the expense of getting a Kosher certification, then do nothing to tell the Kosher consumer that their product is Kosher,” Shapiro said. “It’s a missed sales opportunity to a fast-growing consumer base that is more diverse now than ever.” There is even (as the ad from their website shows) an annual Kosher food show in New Jersey and a whole lot more. So having said all that, what’s a Reform Jew going to suggest for the High Holy Days? I have learned that nothing can beat tradition and most readers will be thrilled to make the same erev Rosh Hashanah meal that their moms and grandmothers made so I will do nothing to try and change that. I will, however, offer a nice seafood meal which would be great for second night or Shabbos or another meal. The best part is --- it’s easy. What You Will Need: --Any white fish of your choice. I have made this with Haddock and Halibut, but this is Maine so see what’s in at the market. --Seasoned Panko Breadcrumbs. --Grated (fresh is best!) Parmesan Cheese --1 Stick Butter, melted. + Bit Of Olive Oil --Lemon juice to taste. How to Make: Preheat your oven to 350 degrees and put your shelf in the centre position. In a baking dish, lightly grease the bottom and sides with a bit of olive oil, then place your fillets of fish along the bottom. These can be a single layer or thicker; it doesn’t really matter. Cover the fish well with a generous layer of the Panko Breadcrumbs and spread evenly. Top that with a layer of Parmesan Cheese. This can be as thick or thin as you’d like, but remember this is a fish dish, not pizza so do not overdo too badly! Next, pour the melted butter over the entire dish, and finally sprinkle on the amount of lemon juice you’d like. I will admit I use the bottled kind, but fresh works even better for those not as lazy as I! Cover the dish with foil and place in the preheated oven for 30 minutes. Remove the cover when the cheese is bubbling and continue to bake an additional 10-15 minutes until the top becomes a golden brown. This can be served with fresh bread (I’m fond of the Rustica at Standard Baking Company, but any crispy crust bread works fine) and a vegetable of your choice. Happy New Year! The Board and the Ritual (formerly Religious Affairs) Committee are very excited about our upcoming High Holiday services. What’s different this year and what has stayed the same? First, what won’t change are the beautiful, inspiring, participatory, easy-to-follow services presented by our rabbi. We always tinker a bit with the liturgy to make the services as meaningful and accessible as possible; but if you’ve observed the Holy Days with us before, the format will be familiar to you. As usual, we’ll be offering eminent guest speakers to supplement Rabbi Berenson’s inspiring messages on the first night of Rosh Hashanah and on Kol Nidrei. On Thursday, September 21, we’re privileged to be welcoming back Aaron David Miller, one of the country’s foremost authorities on the Middle East. He has served as a top analyst for the State Department since 1980. Among his best-selling books are The Much Too Promised Land and The End of Greatness. His addresses to our congregation, whether on foreign affairs or more spiritual topics, are always brilliant. First Circuit. Judge Lipez has had one of the most distinguished judicial careers in the Northeast. We always look forward to his sparkling insights on both the Holidays and judicial history. Perhaps the first change you’ll notice when you enter the sanctuary is that we now have a wheelchairaccessible ramp to the bimah. This was long overdue; but it wasn’t easy to construct the ramp in a way that satisfied our spatial, aesthetic and halakhic constraints. We hope that you’ll be pleased with the results. With the installation of this ramp, along with our fully functioning elevator and refurbished side entrance, our sanctuary is now fully handicap-accessible. Another physical change is that the restrooms have been relocated to the back of the building and have been much improved. Perhaps well-appointed restrooms are not your primary criterion for choosing where to spend the High Holidays; but we do want our congregants to be physically comfortable as well as spiritually uplifted. Additionally, we’re pleased to offer a break-the-fast meal at the conclusion of the Yom Kippur service. In the past, like many synagogues, we’ve provided juice and a snack; but this year (as a noted chef likes to say) we thought we’d kick things up a notch, with light fare appropriate for a fast-breaking meal. Finally, be sure to check out the new art on our walls and in our halls. Our latest exhibitions, starting September 14, are “Holocaust Heroes: Fierce Females,” by awardwinning artist Linda Stern, which is actually in four parts: ten Heroic Tapestries, twenty Spoon to Shell sculptures, a Protector sculpture with Wonder Woman shadow, and a 7-minute looped video; and “Renewing the Act of Creation Every Day,” the photographs of Rabbi David Sandmel (Congregation Bet Ha’am’s first rabbi). On Friday, our speaker will be Anna Bat-Chai Wrobel, poet, historian, teacher and authority on the Holocaust. Those of us who have heard Anna speak, recite or teach know that we’re in for a treat. I look forward to seeing you this Rosh Hashanah and throughout the year.